I was a bit surprised by the emotion on Facebook engendered by my posting (scroll down) about storm tourism. Even though I addressed the essential nature of storm chasing three weeks ago, I want to add in new information for those who do not live in tornado alley, who are not familiar with storm chasing, or would like more information. Let me begin with the fact that Sunday and Monday were bad days for tornado forecasters. I already documented my Sunday bust here. 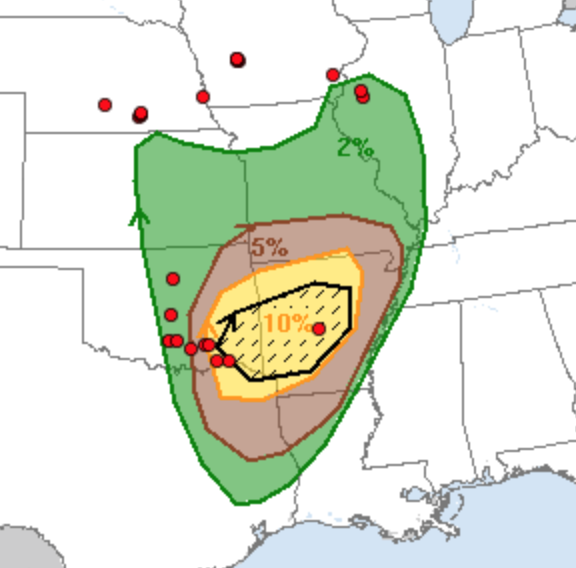 The NWS SPC (normally excellent) had a very bad day yesterday. 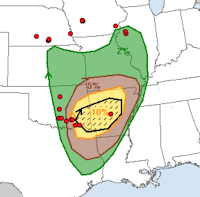 In their 11:30am forecast below, the red dots are locations of tornadoes. Few of the dots were within the 5% area. Some of the tornadoes in Nebraska and Oklahoma were strong tornadoes and they were not in the hatched (strong tornado) forecast. Statistically, meteorologists would want all of the dots within a green area and all but one in the 5% area (the significant threat threshold) or higher. The reason I did so many posts of the storms yesterday (blog and Twitter) was I was concerned the storms might have been taking people by surprise given the lack of early forecasts equal to the level of the threat. The point of this is not to criticize SPC. The point of this is that we have room for improvement with regard to tornado forecasting and warnings. And, that is where storm chasers come in. 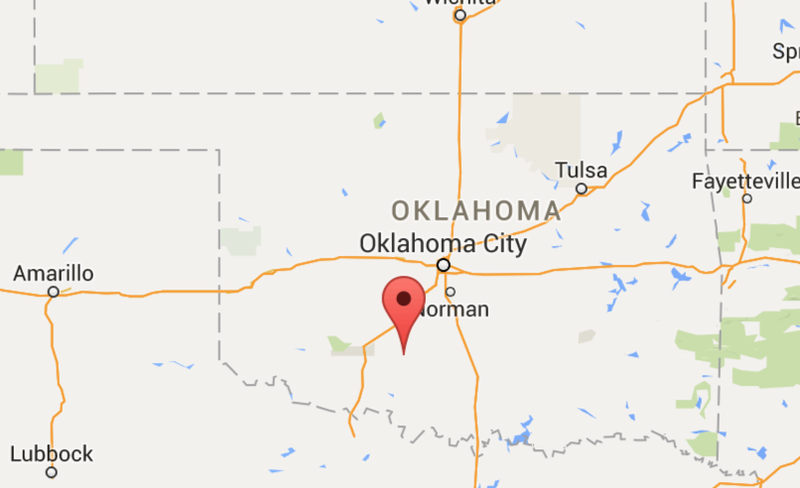 Storm chasers chasers launched a special weather balloon at 12:40pm near Marlow, Oklahoma, very close to where the first of the storms developed (see below). Will that data be helpful? I don't know, but I do know we will not improve forecasting merely by sitting around in buildings. We have to get into the area where storms form. The balloon data, when combined with other data from yesterday, might help reveal what forecasters missed. Storm chasers risked their lives to get a state-of-the-art instrument into the path of a tornado and they were successful yesterday. My friend, and excellent photographer, Robin Lorenson got this photo of one of the pods being deployed ahead of one of yesterday's tornadoes. Then, victory! The pod was hit by the tornado. The data may be crucial for a number of purposes. 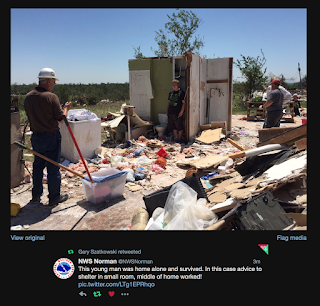 This photo, from the Norman NWS post-storm survey this morning, shows a boy demonstrating where he took shelter. Smallest room, middle of the house; and he survived while everything around him was destroyed. The goal is to better understand the nature of the wind currents in a tornado so that we can inexpensively design homes and buildings to better withstand tornado winds in the EF0-2 tornadoes (the most common). But, we can't do that without the type of data collected yesterday. What About the Other Chasers? Provided they obey the law (there are some bad apples) storm chasing is beneficial and every single photograph of a tornado can be valuable. Take a look at the National Geographic reconstruction of the El Reno tornado. It was accomplished with hundreds of photos taken by storm chasers from every angle. The late Ted Fujita was a master at extracting data from a single photograph. I have known of chasers who have saved lives in post-tornado rubble, told the Joplin police to "Get the sirens on!! ", intentionally blocked a road with a power line across the road at about 5' which could have decapitated a motorcyclist or driver who might have driven into it, etc., etc. There are a number of chasers (including yours truly) who chase with work gloves in the truck in case we come across an emergency and we can be of assistance. 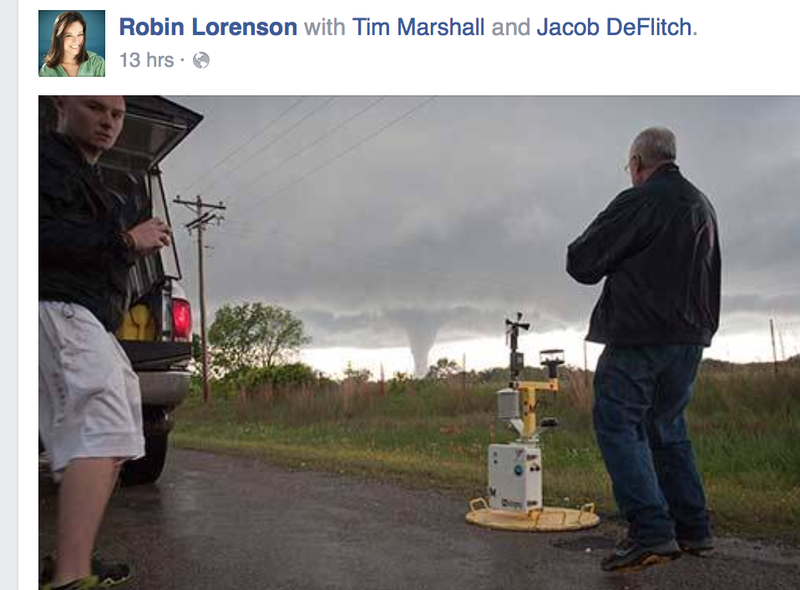 Storm chasing and storm tourism are activities that benefit society. Let's wish those doing storm research the very best of luck and safety the rest of the 2016 storm season. To the rest of the storm chasing community, please be prudent and safe. May all of the tornadoes be in unpopulated areas! !